In recent years, lateral hip pain has been termed greater trochanteric pain syndrome (GTPS), but is often called trochanteric bursitis. GTPS is relatively common and affects 10-25 % of the general population, between 40-60 years, and there appears to be a higher prevalence of GTPS in women, and in adults with associated knee osteoarthritis. However, GTPS is not uncommon in younger people. Direct impact injury to your lateral hip e.g. a fall, and/or excessive pressure. Sudden increase in strain through the lateral hip muscles (LHM). Typically, the GTPS patient presents with pain in the region of the greater trochanter (GT), buttock or lateral hip. Symptoms are often described as a deep, aching or burning pain sensation, and may last over 12 months. Most GTPS sufferers’ main complaint is at night, with intense pain due to lying on the painful side, but also occurs lying on the non-painful side. Pain may worsen when getting up from a low seat, or with exercise, particularly on uneven ground and ascending and/or descending hills/stairs. GTPS is an umbrella term, encompassing potential pathology to a number of structures including the trochanteric bursa, LHM, the ilio-tibial band and tensor fascia latae muscle. Historically, the general consensus for the main cause of GTPS, was inflammation of the trochanteric bursa, located between the gluteus medius and minimus tendons (Figure 1), but the latest research shows bursitis only in a minority of patients’. Recent research discovered that the main cause of GTPS is more likely tendinopathy of the LHM, more specifically the gluteus medius and minimus tendons. At ECP, diagnosis of GTPS is normally based on your symptoms and a thorough full examination. However, at ECP we have the option of using diagnostic ultrasound to confirm or rule out certain diagnoses. In certain circumstances an x-ray or MRI maybe required to rule in or out other pathologies, which may cause lateral hip pain. At ECP we use a combination of treatments to successfully treat GTPS including manipulative ‘hands on’ physio, specific loading exercises and extracorporeal shock wave therapy (Figure 2). In recalcitrant cases, ECP can also offer a steroid injection to aid pain relief alongside physiotherapy programme. Figure 1. 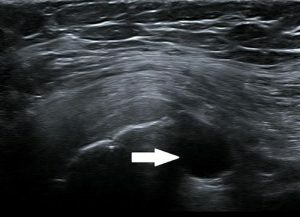 Greater trochanter bursitis as demonstrated on diagnostic ultrasound. Figure 2. Excellent results with ESWT for GTPS.